The BudgetLine offers a semi-automatic shearing / cutting line that will increase your production over manual shearing. The BudgetLine may include a powered infeed conveyor for moving the material to the adjustable gauge stop. The operator only needs to unload the material after it has been cut. 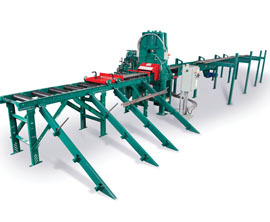 The BudgetLine includes a high capacity shear that handles any size rebar up to #14 (45mm) bar. Maximize your rebar cutting while minimizing your investment with the KRB BudgetLine.